The Glaucous Gull is not shy about taking a free meal and will scavenge food from landfills or fisheries, given the opportunity. Mr. Declan Troy, of Troy Ecological Research Associates, studies the relationship between management of waste and foraging behavior of the Glaucous Gull. The increasing population of Glaucous Gulls has caused scientists to question whether available food from landfills and fisheries has influenced population growth. Glaucous Gulls are predators of waterfowl nests. As their population grows, scientists are monitoring the impact on waterfowl populations. Glaucous Gulls have an interesting and delicate relationship with some waterfowl species. They are very protective of their nests and do an excellent job of keeping predators away. Certain species of waterfowl such as Pomarine Jaegers and the threatened Stellers Eider have been observed purposefully nesting near Glaucous Gulls to take advantage of their protective nature. They must be cautious, however, as Glaucous Gulls feed on the eggs and chicks of waterfowl. The nesting waterfowl will quickly flee the breeding grounds after their eggs hatch to avoid predation by the gulls that helped protect their nests! 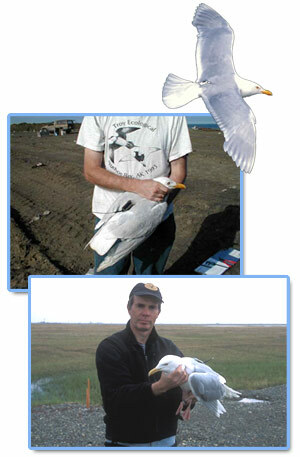 Signals of Spring students have access to satellite data tracking data for three of the many gulls that Mr. Troy studies, known as Soren, Azura, and Gilligan. The first two birds were trapped and tagged with solar powered satellite markers at a landfill in Barrow, Alaska, in 2004. Gilligan was trapped nearby while nesting. The landfill in Barrow is closing in the Fall of 2006. A new landfill will open in its place and has already planned to manage food waste so that gulls do not have access. Landfill facilities can control access to food by incinerating (burning) it or by burying the food waste quickly so that gulls cannot scavenge. Other landfills, including one in Anchorage, have successfully kept gulls away by extending wires above the landfill. Interestingly, Soren, Azura, and Gilligan as well as other gulls that Mr. Troy tracks have been very well behaved. They have made little use of landfills for food. So far, Mr. Troys research does not show that the increase in the population of Glaucous Gull has been due to scavenging from landfills or fish waste. He suggests that Signals of Spring students use satellite data to determine if the gulls are visiting communities where they have access to supplemental food while migrating. For other interesting research questions, Mr. Troy recommends that students investigate how ice and sea surface temperatures affect the northward migration of Glaucous Gulls. Gulls tend to hang out on floating ice in the ocean and feed on fish. Mr. Troy suggests that students ask if ice melting is a signal to the gulls that they should fly farther north. Students can access sea surface temperature maps on the Signals of Spring website. Signals of Spring students may investigate the relationship between marine productivity, how much energy there is available in the marine food chain, and the migratory pattern of the Glaucous Gulls. Phytoplankton maps are available to help them determine this relationship. Students could also use satellite data to calculate the speed of migration during the Spring and Fall. The three gulls are currently spending the winter in Russia. Gilligan and Azura are expected to return to Barrow as they have in previous years. Sorens behavior is a little less predictable. This bird remained in Russia last year and went to Canada the summer before. The birds will most likely cross the Bering Sea to the Yukon Delta then proceed north in Alaska to reach their breeding grounds. Occasionally, birds will fly north in Russia before crossing over the ocean to Alaska. Keep watch to see which route they choose this year.